Crawfish, Shrimp and Crab Boil. Complete. Nothing To Add. or 75 pounds of shrimp. 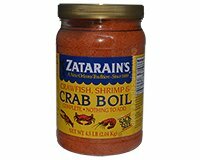 Place 6 gallons of water and contents of entire package of Zatarains Complete Crab Boil into large cooking container (60 to 72 quarts), stir and bring to a rolling boil. Add seafood to boiling mixture, stir, covering tightly and return to boil (if seafood is not covered by water, then add additional hot water). Cook fo rthe time shown below. Turn off heat and Soak for the time shown below. For a spicier flavor, add cold water or ice to pot at end of cooking time and soak longer. For smaller quantities of seafood: use 1 cup Zatarain's Complete Crab Boil with 8 to 10 pounds of shrimp, 5 to 8 pounds of crawfish or one dozen crabs. For extra zesty flavor, try adding Zatarain's Liquid Crab Boil and/or Cayenne Pepper. Ingredients: Salt, Dextrose, Spices (including Red Pepper), Natural Flavor, Extractives of Paprika, Monosodium Glutamate (MSG, a Flavor Enhancer) and Lemon Juice Concentrate.